With deep fryers you can prepare fried foods like french fries right in your own kitchen that have restaurant-quality taste. The main feature you should look for in the best deep fryer is the ability to heat the oil up to the proper temperature quickly, usually 375 degrees, and be able to recover to that temperature once food is added. This will ensure properly cooked food that is healthier and less greasy in a timely manner. Some other important features you should look for include the capacity, adjustable temperature, oil filtration or drainage system, baskets, and a lid to prevent splattering. We looked at dozens of models comparing their features and performance and found the lowest price for each to narrow down our list. Below we review the top 10 best deep fryers. We picked the $110 Breville BDF500XL Smart Fryer as the best deep fryer due to its superior performance. This 1800 watt appliance will heat the oil to the proper higher temperatures needed for foods like french fries, which many others have trouble doing, all while maintaining consistent temperatures with a quick recovery time. The BDF500XL has a 4 quart oil capacity which can cook up 2.5 lbs of food at once. It includes a stainless steel cooking bowl and basket which are both dishwasher safe. There are preset cooking options plus a custom setting which lets you adjust the timer and temperature to whatever you need. One of the negatives of the BDF500XL is the price since there are cheaper options available, however if you want a reliable high-performance fryer than we highly recommend this Breville model. 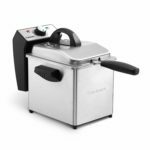 The best feature on the $93 T-fal FR8000 Ultimate EZ Clean fryer is its patented automatic oil filtration system along with the one-step oil drainage system which filters, drains, and stores the oil in a separate sealed container for the next use. This T-Fal unit has a 2.65 pound food capacity which is the most of any deep fryer on our list while using 3.7 quarts of oil. If you want an easy way to clean, filter, store, and reuse your oil then look no further than the T-fal FR8000 Ultimate EZ Clean. 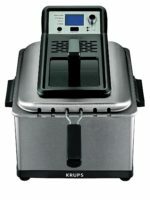 Another outstanding performer is the Krups KJ502D51 Automatic Triple Basket Deep Fryer which sells for about $74. This 1800 watt model heats up quickly and keeps the oil at a consistent temperature. Four preset functions automatically adjust temperature and time for perfect results, while manual settings are easy to use thanks to a digital display. The KJ502D51 uses the most oil of any fryer on our list at 4.75 quarts, but it can fry 2.6 pounds of food at once. It comes with 3 baskets – 1 large one for big batches or 2 smaller ones for frying 2 different foods simultaneously. If frying performance is the most important factor for you and you want to spend less than $100 then this Krups deep fryer is for you. The $60 Krups KJ33 Easy Pro Deep Fryer performs quite well while using much less oil – 2.64 quarts worth to fry up to 2.2 pounds of food. The temperature can be adjusted from 300 to 375 degrees F and users have found it to be very accurate. It comes with a cooking basket with a snack tray accessory which lets you fry two different foods at once without them sticking to each other. Overall the Krups KJ33 Easy Pro is a great choice for someone looking for a more affordable deep fryer that still gets the job done. If you want healthier fried foods, especially french fries, then you should consider the T-fal ActiFry Low-Fat Multi-Cooker for around $150. It reduces the fat in your food by using dramatically less oil per serving. To use it you simply add your food, fries for example, then add a tablespoon of oil and set the timer. The unit then uses a stirring paddle and pulse heat system to evenly distribute the oil and cook the food evenly. 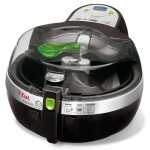 This T-fal appliance is not exactly a deep fryer – we would describe it more like a cross between a fryer, oven, slow-cooker, and skillet with an automatic stirrer. For that reason the ActiFry will not work well for many typical fried foods especially those with a batter. We would recommend this for anyone who wants a unique cooking device and especially wants to make healthier fries. The $54 Presto 05466 provides a large 12 cup food capacity in a budget price. It scored a very solid 4.3 stars from users on Amazon. This 1800 watt unit will let you cook two different items at a time through the use of the two oblong baskets. It has an adjustable thermostat, but we found that it is not the most accurate and it takes a little bit of experimenting to get temp you want. While this is a pretty solid appliance it does not really compare with the larger ‘professional’ models. We recommend this Presto model for those who need to prepare above average amounts of fried food, but want to spend as little as possible. One of the best medium sized deep fryers is the $48 Presto 05462. This 1800 watt model will hold up to a gallon of oil and cook 9 cups of food at a time in its oblong basket. It has digital controls, an adjustable thermostat, and a lid. The biggest weakness on this model is how long it takes to heat up the oil to the proper temperature – a full 15 minutes or more – or reheat the oil after adding the raw food. 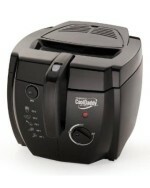 The best small capacity deep fryer is the Cuisinart CDF-130 Compact Deep Fryer which sells for about $44. It has an oil capacity of 2 quarts with a food capacity of 1.3 pounds. We like the fact that it heats up in around five minutes to full temperature and recovers quickly once frozen food is added in. This produces excellent results, although you can’t fry large batches at once. Overall the Cuisinart CDF-130 Compact Deep Fryer is a perfect choice for anyone who only needs to fry small servings for about two people at once. Another small capacity deep fryer option is the $35 Presto 05422 CoolDaddy. It can hold 64 oz of oil with a food capacity of 6 cups. It also has an adjustable thermostat, wire basket, and lockable cover. One nice safety feature that is unique to this model is that it is cool to the touch and thus is much less of a fire hazard and safer to use. The biggest problem with this unit is that the oil just does not heat up to the full proper temperature like it should. With that said if you stick to smaller amounts of food to prevent the oil from being to cold to properly fry your food, you can help prevent getting soggy, greasy food. 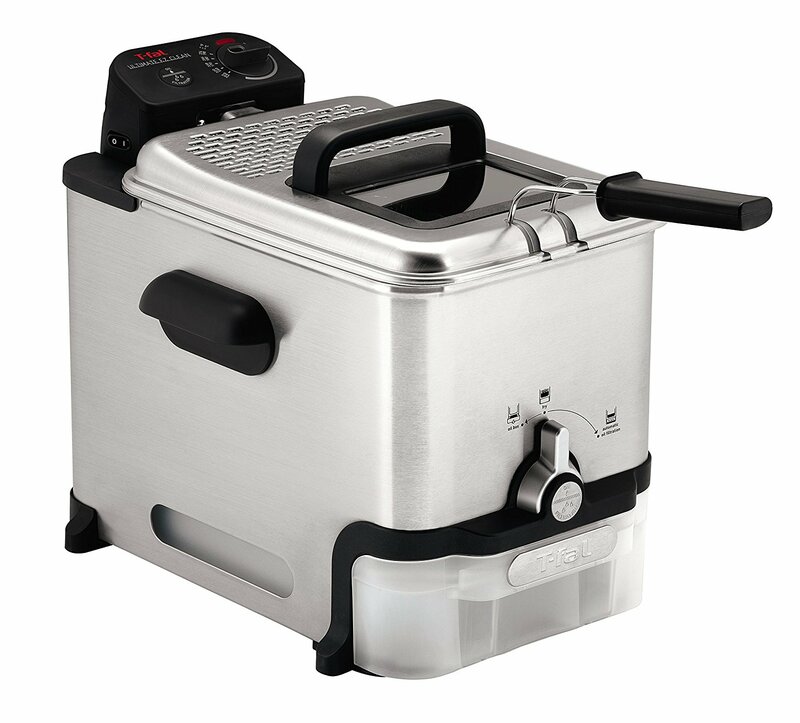 The cheapest deep fryer on our list if the Presto 05420 FryDaddy available for less than $27. This is a bare bones unit that is basically just a container and a 1500 watt heating element. There is no adjustable temperature instead it is just preset. There is also no basket or lid to prevent splatter. It does heat up pretty quickly to between 350-375 degrees and has a capacity for 4 cups of oil. Users can also use lard with this model if they prefer, while most other fryers require the use of cooking oil. We recommend the Presto 05420 FryDaddy for those of you who want a cheap model that can still get decent results. Just remember it is small so you will not be able to cook for lots of people at once.